8 months ago I’d had a gutful of hearing that Brisbane is the next growth city and that Sydney is too hot now. The suggestion was for investors to move their money out of Sydney and into Brisbane. Some of this advice was easy to ignore – it was from developers with a vested interest. “Brisbane follows Sydney by 18 months” they said. It had been more than 18 months since Sydney started its growth phase, so I guess it was a good time to spin that unfounded nonsense. Some of the “advice” was from independent data providers and major real estate franchises with offices around the country. They had little to gain apart from some media attention. But these remarks were merely the last straw in a long line of B.S. about Brisbane I’d been hearing since 2012. It got a bit louder in 2013. It got even louder in 2014 when Sydney price growth was unfettered. By early 2015 it finally got to me. Sooner or later they will be right about Brisbane. But how long must an investor wait, paying interest on a loan before some significant growth in Brisbane occurs? I outlined why Brisbane was unlikely to outperform Sydney and why 2015 was still going to be a year of Sydney at the top. 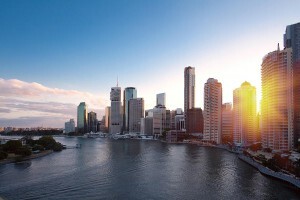 Brisbane was not the stand-out performing city in 2013, 2014 nor 2015 – Sydney was. The reason why was of course due to the forces of supply and demand as it always is. The DSR+ is a combination of 17 capital growth forecasting indicators. As you can see Sydney was way out in front. This meant it was the market with the most demand relative to supply of all the state capitals. And as the year unfolded, the capital growth matched that forecast. Sydney’s growth outperformed all other cities. And Brisbane’s growth was “disappointing” in the words of Dr Andrew Wilson of Australian Property Monitors. Although Sydney is still top of the pops, there’s not much in it now. And interestingly Hobart is showing a lot of promise despite all the negativity about Tassie’s economy. One of the big arguments for Brisbane was affordability. Well if that’s a drawcard, then Hobart trumps Brisbane. And on top of that yield is so much better. One of my recent clients was after cash-flow positive property. The best markets I could find with good DSR+ and a suitable yield were all in Hobart. 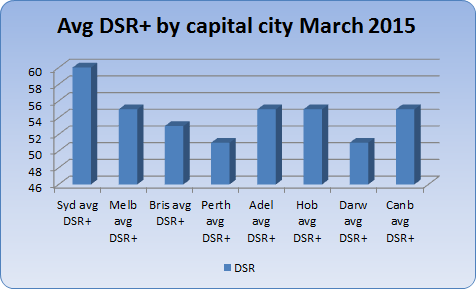 Anyway, you’ll note that Brisbane’s DSR+ hasn’t improved much over 2015. So it will probably get much the same rate of growth as it had in 2015. Also, note that Perth and Darwin are stand-out cities to avoid. But that’s not to say there won’t be any opportunities in those cities. Remember these are average DSR figures. Pop quiz – which of the stats above is the most important for an investor to look at: the average, the minimum or the maximum? Answer: Given we can’t buy a city, the average is irrelevant. 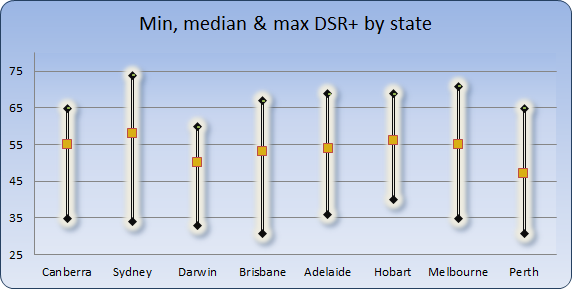 And given we don’t want the worst markets the key stat is therefore the maximum DSR+. This sits at 74 out of 100 and is still in… Sydney. This means there is at least one really good market left in Sydney that should outperform markets elsewhere around the country over the next 12 months. The above chart also shows that there is at least one market in Perth that is likely to outperform the average for Sydney over the next year. So despite how negative Perth in general is, careful choice of a good suburb in a bad city will outperform a poor choice of suburb in the best city. BTW: the reverse is true for property selection. That is, you’re better off buying the worst property in the best suburb than buying the best property in the worst suburb. 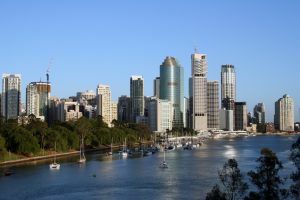 Those who bought in Brisbane early in 2015 instead of Sydney missed out on significant growth. A 5% difference in growth rate for a $500,000 property represents a mistake costing $25,000. But a typical growth investor who chose Brisbane over Sydney in early 2014 has made a mistake closer to $100,000 in opportunity lost. Now imagine the cost if you chose to accept that bad advice in mid-2012. Technically Brisbane is not a “no-grow-zone” as the title of this post suggests. More accurately, growth will occur but simply not at the rate investors should be pursuing. Those investors wondering if it is too late to buy in Sydney should have no fear since there are still some great opportunities. 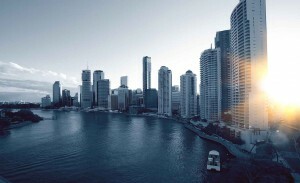 It is still a preferred market to invest in over Brisbane for now. But sooner or later Brisbane will have its time at the top. 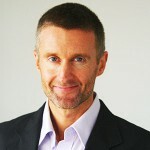 Lastly, don’t get sucked into the developer marketing hype about Perth being at the bottom ready to boom. You’ll be waiting for a lot longer than they suggest. If you have to buy there, then choose very carefully. Jeremy really has no clue about the Brisbane market. I suggest he has no property in the city…therefore, no idea. 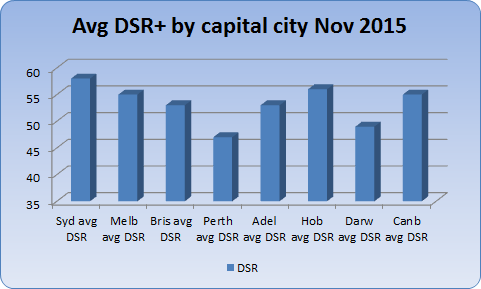 I was interested in the comment made in reference to Chart 3 (min, max, avg DSR+ by state capital November 2015) that the chart “shows that there is at least one market in Perth that is likely to outperform the average for Sydney over the next year.” The author makes it sound like this is obvious from the chart; can you please explain what aspect of the chart show this assertion to be the case? I think it is all subjective and obviously Jeremy loves Sydney which was evident from his editorial. That alone makes me very sceptical of his assessment of the Brisbane market and his comments tend towards someone who specialises in Sydney so of course he would want investors to buy there. True it has been a. Standout but I think he is biased as evident from his tone and comments. Personally I would be careful with his recommendations. Metropole recently bought a property for me in Brisbane, and now reading your article makes me thinking If it was a mistake !!!! In my strategy though I do not buy to sell in short term but again you know…I definitely had the opportunity to buy in sydney but got told that Brisbane is actually good , a bit confusing Michael!!! I don’t always agree with everything that is posted on Property Update – I’ve included this post – but we don’t editorially restrict our regular contributors to help give our readers a balanced view. Michael does Metropole subscribe to Jeremy’s DSR data tools to assess supply and demand at a micro suburb level to assist in property selection? I’ve met Jeremy and like his work and his ideas. 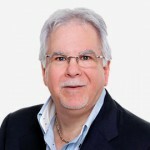 I don’t always agree with everything he says, including some comments in this post – but we don’t editorially restrict our regular contributors to help give our readers a balanced view.